Local teen Jimmy Nguyen chose never to say a word to anybody, even his own family, for years and years. Singing in music class gave him the impetus he needed to decide, for once and for all, to to come out of his shell. Now all his friends call him "star." Play all day. . . Even adults learn more via play than through drill and direct instruction. Listen to this brief NPR article for the latest research, and then go play with kids! 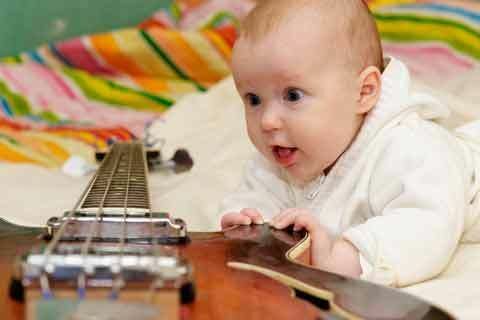 Babies love music. Babies love rhythm. Babies are capable of rhythm. duh. Monsters under the bed? Make 'em go away! I've learned that secure attachment is the best medicine for for healthy growth and development--and also for traumatic early childhood experiences, from multiple surgical procedures even to prolonged abuse and neglect. And guess what promotes secure attachment? Face-to-face play. Tuneful, rhythmic one-on-one conversations between mother and child, or father and baby, or nanny and preschooler, or grandfather and grandchild. This is why, in every single parent-child music class I teach, I include a lap bounce such as "Trot Trot to Boston" or "This is the Way the Ladies Ride," wherein I invite (or encourage, or sometimes beg) the grownups to persuade their child to turn face-to-face. By building fun and laughter in face-to-face high-energy interactions, we are stimulating everybody's brain to release pleasure and attachment chemicals such as oxytocin, dopamine, and endorphins. Even stress hormones such as adrenaline and cortisol come into play in a balanced, beneficial way. So bend your knees and bounce your child . . . at home, on the playground, or in music class. What's Play-Doh got to do with music class? The other day, after teaching preschool music classes, I was chatting with the preschool director about how Play-Doh continues to be interesting, and educational, for children over many years. Two-years-olds engage in it through pure sensory exploration; four-year-olds figure out how to form spheres and cylinders; five-year-olds craft delicate figurines to give you for Mother's Day. In just the same way, children in our music and movement classes extract age-appropriate challenges from the musical materials that we leave "lying around" for them. This is why, when I say "developmentally appropriate," I mean a mixed-age classroom, with children from birth to at least five. One thing that "developmentally appropriate" does NOT mean is telling children what achievements are expected of them at their age. What is preschool? Is it "one big playground?" And just what is the value of play in childhood? Preschool is not for drill and instruction. It is also not for completely unmonitored, unstructured play. The most effective play is gently guided and coached by adults or wise older children. Thanks, New York Times, for bringing this to our attention. Play is the work of the child. Children learn everything through play. Play is how--we hope--the child grows to be the kind of human being we can all be proud of. This is why, at Music Together®, we almost imperceptibly guide children through musical play. If you are raising a two or three year old, just get this CD. Dancing around the maypole in preschool music classes tomorrow! Putting the finishing touches on it this evening. Yes, swordplay. In preschool. Tomorrow. Be there or be. . . a scurvy knave? One of my Four-Year-Old classrooms is doing a unit on castles, and I think they have enough self-regulatory control at this point to handle rhythm sticks and even pretend play as fighting Knights of the Round Table. If you're reading this blog, you've guessed what supports their self-control: music! Yes, it's going to be some loud Backyardigans music with a strong rock backbeat to ground the slow tempo, and a nice minor key to keep them serious. I can't wait to see how it goes! As music specialist at half a dozen preschools (that's the current ones alone, mind you), I find that classroom teachers are always hungry for more ways to integrate the arts into the children's everyday life. 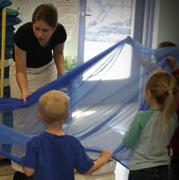 Luckily, the Early Childhood Music and Movement Association gave me the chance to review a piece of research on just how to make this work most accessible to classroom teachers. Of course, the results of the research sound exactly like the philosophy that we espouse every day in our parent-child classes: be a good role model! Music specialists are responsible for being a role model that classroom teachers will want to emulate, so that classroom teachers can be musical role models for the children. Quod erat demonstrandum. Click here for the full article.